What a treat! Berry-hued blooms make a cheerful, fun display for any occasion. Six red roses, plus irises, lilies, and more, make a beautiful declaration of your best wishes! 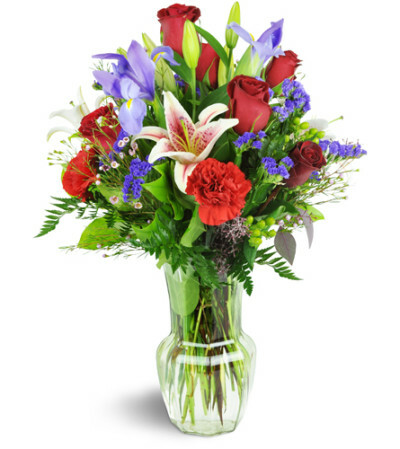 Red roses and carnations, plus pink Stargazer lilies, irises, statice, and more, are arranged in a classic clear glass vase. 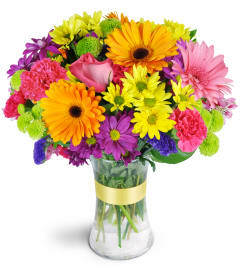 I chose Windsor Florist after perusing many online Florists in NYC. I was so impressed with the website I decided to order flowers for both my daughter's birthdays on the same weekend and ordered the day before. 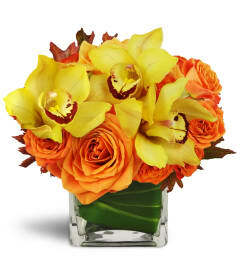 I saw both arrangements and they were as beautiful as the photos and the flowers were of the highest quality. Thank you. Diane V. I give them 5 stars.